Andrews McMeel Publishing, 9781449408206, 240pp. Hot on the heels of his smash 40: A Doonesbury Retrospective, Garry Trudeau is back with an annual collection of this iconic comic strip. Readers and critics were wowed by G. B. Trudeau's epic masterpiece 40: A Doonesbury Retrospective, and they'll rejoice when they see this beautiful follow-up volume. 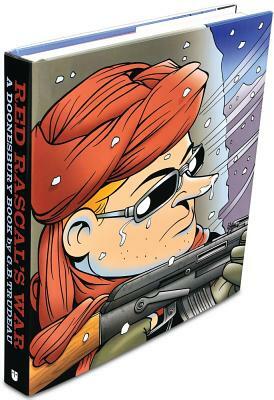 Featuring an innovative format and an all-new collection of strips, Red Rascal's War is the first all-color Doonesbury book ever. Both Trudeau and his fans have followed Doonesbury's ever-expanding cast through four decades of cultural turbulence and change. With its arresting cover and rich interior, Red Rascal's War showcases the most recent additions to a body of work the New York Times admiringly refers to as "a sprawling masterwork." "[Trudeau is] Dickensian in his range of characters," writes Garry Wills in The New York Review of Books. "Trudeau has just kept improving, year after year, in part because he stays so close to changing events. . . . He has never been better than in the last six years." From the exploits of Afghan legend-in-chief Sorkh Razil to the pipe dreams of Malibu's top nanny Zonker Harris, and from the "no more chill pills" intervention by Obama's aides to the way-cool love of a headbanging war vet and his MIT-grad gal, Doonesbury marches wildly on.